Bag / Pocket Middle - Shoulder, Extra Small. 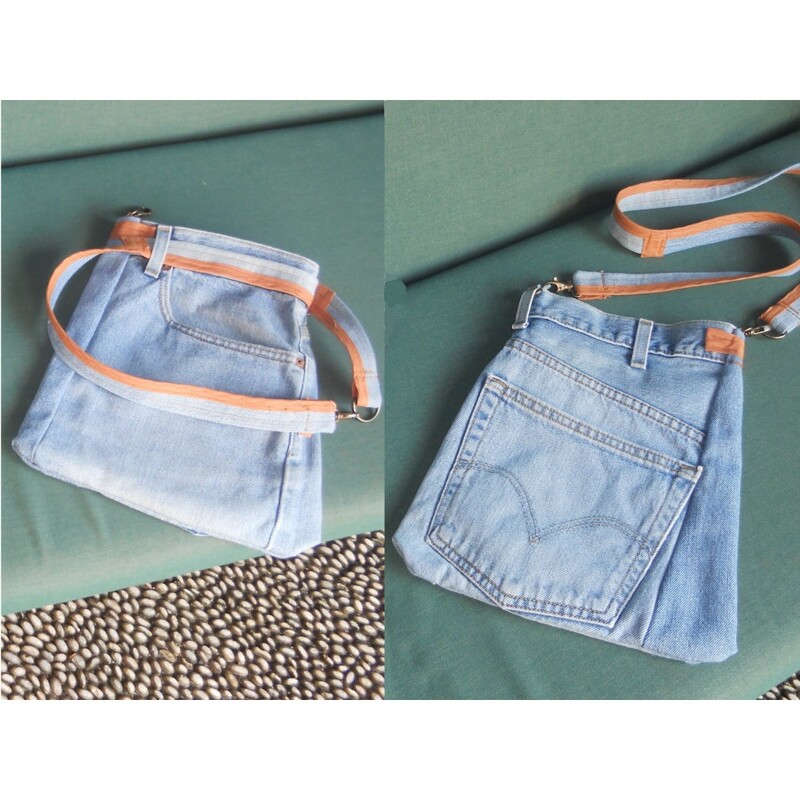 Bag / Pocket for the waist or shoulder, Extra Small. It is made from a man’s light blue-jeans trousers with orange - brown details and has a long strap, which is either hooked in the rings, so the bag hangs on the shoulder or is worn as the belt (double rotation) and becomes a bean bag. A handy bag, especially for our athletic garb, that has an unfortunate lack of pockets!! This product belongs to the series: My Green Project - Group A– Fabrics/1 that includes ideas for converting old trousers to spacious bags, with many practical pockets, also with an undeniable resilience. Besides, who does not have an "old jeans, pretty spoiled to wear, but also quite loved to throw it away???" ... an original way to save space, relieving our wardrobe and enriching our lives! The price of these products includes all costs of materials (tailoring, interior fabrics, laces, strings, straps and other decorations), provided there’s a used trousers in stock, or alternatively you could send (at your expense) your own pair. We also note that, before the conversion, the used trousers is washed at a high temperature and ironed with a steam press, in order to disinfect and reuse it safely, so you may have slight differences in color and the final size of the bag (width). We also provide the possibility to use new trousers, the cost of which will be added to the final price of the product.